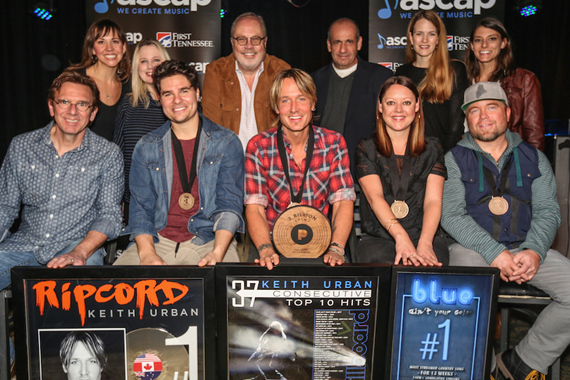 ASCAP honored Keith Urban’s latest No. 1, “Blue Ain’t Your Color,” written by Clint Lagerberg, Hillary Lindsey and Steven Lee Olsen, on Friday, March 3 at Nashville’s Basement East. Urban’s 22nd No. 1 was not only nominated during the 2017 Grammy Awards but is up for Song and Single Record of the Year at the ACM Awards where he leads the nominations with a total of seven. Voting for the April 2nd event closes March 6. 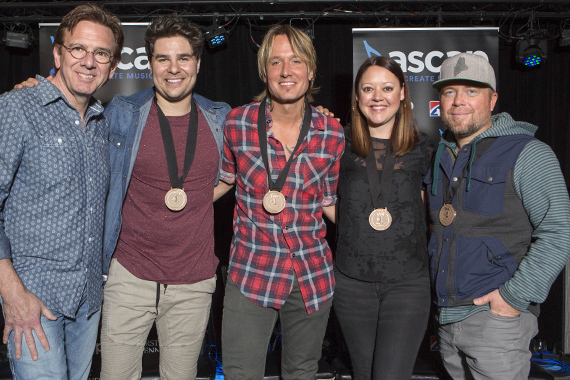 As tradition with an Urban party, the songwriters joined the Capitol Records Nashville artist on stage to perform the track and kick off the event. ASCAP’s Mike Sistad was on hand to welcome the crowd on behalf of sponsor First Tennessee Bank, and helped introduce the songwriters and artists with creative manager Beth Brinker. Olsen had the idea for “Blue Ain’t Your Color,” and originally held the song for the Canadian’s Columbia Nashville project, which was never released. Universal Music Group’s Mike Dungan then took the stage to “expound on the magnificence” of Urban, who celebrates his 20th year at the label this year. “It’s wonderful that a magnificent work of art is being appreciated by the rest of the world,” commented Dungan after touting stats for Ripcord. 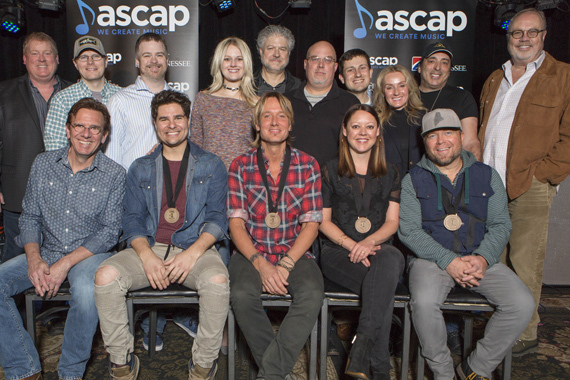 Dungan delivered impaler awards and streaming plaques to songwriters in addition to a plaque for Urban, commemorating the Ripcord‘s No. 1 status in three territories: Canada, US and Australia. Additional presenters included Jim Asker of Billboard for Urban’s 37 consecutive Top 10 hits not including “The Fighter,” which brings the total to 38. Billboard‘s record for the constraint is 41. Pandora’s Rachel Whitney and Beville Dunkerley delivered a wood record plaque and noted a cumulative spin total for Urban at 2 billion spins on the service. Holly Freeman from the CRB and Brandi Simms from the CMA also presented. Produced by Dann Huff mentioned mixing “legend” Chris Lord-Alge before Urban welcomed him to the stage. Urban went on to thank many of the studio players involved. He concluded, citing his influence from Nashville, including Don Williams/Garth Fundis records (like Portrait), which helped Urban understand how minimalism in the studio can frame a song just right.